In Ecuador, we have two nurseries at the foot of the Cayambe volcano, an hour’s drive north of the capital Quito. The nurseries are situated at an altitude of 2,850 metres above sea level and together cover 40 hectares. Cayambe is located on the equator, which guarantees 12 hours of sunlight a day, 365 days a year. Ecuador enjoys a mild climate with six months of winter (rainy season) and six months of summer (sunny). The mild climate along with the intensity of the sun’s rays ensures optimal cultivation conditions for roses. Ecuador’s roses are renowned the world over for their big flowers, long vase life, superior quality and intense colours. In Ecuador, we produce a broad range of roses with various lengths: from 30 cm up to 120 cm. The roses are cultivated in greenhouses equipped with a computer-controlled climate system. This allows us to achieve optimal cultivation conditions, which includes high humidity and nutrient-rich soil. In addition, our nurseries possess a propagation facility, processing halls, cold stores and cooling tunnels. While inside the greenhouses and also after the harvest, the roses are constantly checked for quality, including stem length, maturity and flower size. After harvesting, we arrange the stems in bunches of 20 or 25, which are then carefully packed for their journey to the Netherlands. The roses are transported by air to our distribution centre in Noordwijk. Their journey takes no more than two days. Our nursery in Ethiopia is located some 20 kilometres from the capital Addis Ababa. The nursery is situated near the Lafto Terara mountain peak at an altitude of 2,300 metres and covers an area of 26 hectares. The climate is mild in this part of the world, ensuring good sunshine and an average daytime temperature of 25-30 degrees Celsius for nine months a year. The rainy season lasts three months and is primarily characterised by cold, damp nights. We cultivate 15 different types of FAIRTRADE roses in Ethiopia. These roses are grown on coconut substrate in modern greenhouses. An advanced irrigation system ensures that the plants receive sufficient water and fertiliser. A drain pipe collects 50 per cent of the used water, which is filtered and reused. Facilities at the nursery include a processing hall and cold stores. 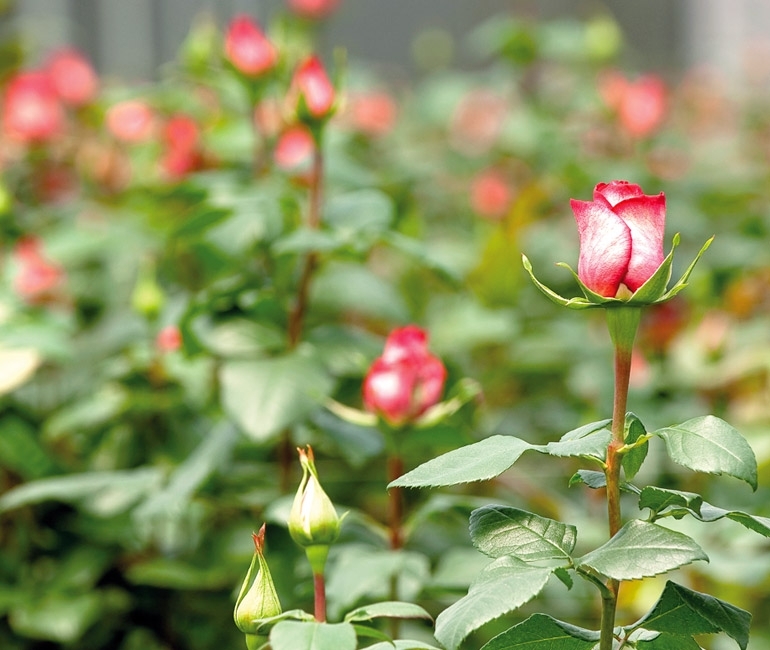 While inside the greenhouses and also after the harvest, the roses are constantly checked for quality, including stem length, maturity and flower size. After harvesting, we arrange the stems in bunches of ten, which are then carefully packed for their journey to the Netherlands. The roses are transported by air to our distribution centre in Noordwijk. The journey takes no more than two days.